This morning the precious metals are rallying higher. Recently, gold and silver have been trading in tandem with oil. This morning WTI oil has surged higher by $2.18 to 106.45 a barrel as the Middle East and North Africa remain in turmoil. Anyone that has followed the problems in that region over the years know that problems do not disappear quickly in this region. The SPDR Gold Shares (NYSE:GLD) are trading higher by $1.41 to $140.07 a share. The all time high for the GLD was $141.28 made on March 24, 2011. This morning the problems in Ireland, Portugal, and most other Euro-zone nations have emerged and this is definitely giving the precious metals a boost. Often the European Central Bank will purchase bonds in order to keep bond yields lower when they spike on debt fears. Anytime money is created by these central banks it will benefit gold and silver. The Federal Reserve buys bonds in the United States everyday via it’s permanent open market operation and we see the U.S. Dollar Index decline almost on a daily basis. Traders must watch the $141.28 level for intra-day resistance on the GLD this morning should it trade up there. The iShares Silver Trust (NYSE:SLV) is trading higher by 0.36 cents to $36.89 a share. 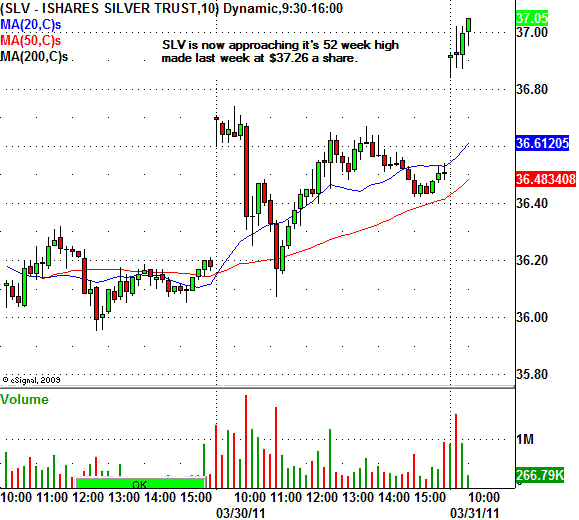 The SLV made a new high on March 24, 2011 at $37.26 a share. Therefore, this level will minor intra-day resistance for the SLV. Should the SLV make a new high today the $38.00 level will be the next intra-day resistance level. As long as central banks around the world continue to create more money and devalue the currency gold and silver could continue to climb higher. Traders and investors will continue to buy gold and silver until the Federal Reserve begins to strengthen the U.S. Dollar. This morning the U.S. Dollar has once again declined and is trading lower by 0.22 cents to $75.90.